About 276,000 people in the U.S. currently live with spinal cord injuries, with an additional 12,500 new cases every year. These injuries affect one of the most complicated and mysterious areas of the body—an area that many injury survivors knew little about prior to their accident. Knowing the basics of central nervous system anatomy can help you better understand the information your doctor provides, empowering you to be a better advocate for yourself or a loved one. A lot of confusion revolves around the distinction between gray and white matter in the brain, but the difference is actually a pretty simple one. Gray matter, named for its pinkish-gray color, is home to neural cell bodies, axon terminals, and dendrites, as well as all nerve synapses. This brain tissue is abundant in the cerebellum, cerebrum, and brain stem. It also forms a butterfly-shaped portion of the central spinal cord. The back portion of this butterfly shape is known as the posterior, sometimes called the dorsal gray horn. This region passes sensory information via ascending nerve signals to the brain. The front part, which is sometimes called the ventral gray horn, sends descending nerve signals governing motor activities to your autonomic nerves. A problem with the dorsal gray horn may affect your brain's ability to interpret sensory information, while issues with the ventral gray horn interfere with your body's ability to receive motor information; paralysis, tingling, and muscle weakness are often the products of damage to the ventral gray horn. The white matter of your brain and spinal cord is composed of bundles of axons. These axons are coated with myelin, a mixture of proteins and lipids, that helps conduct nerve signals and protect the axons. White matter's job is to conduct, process, and send nerve signals up and down the spinal cord. Damage to the white matter of your brain or spinal cord can affect your ability to move, use your sensory faculties, or react appropriately to external stimuli. Some people with damaged white matter suffer deficits in reflexive reactions. Posterior tracts: These tracts, located at the back of your spinal cord, convey information from your skin about pressure, touch, and pain. They also help you position your body and space, so you can move according to your surroundings. Spinothalamic tracts: These sensory tracts tell your brain about your body's temperature and pain level. Corticospinal tracts: These motor tracts send nerve signals from the brain, down the spinal cord, and into various skeletal muscles, enabling you to move. 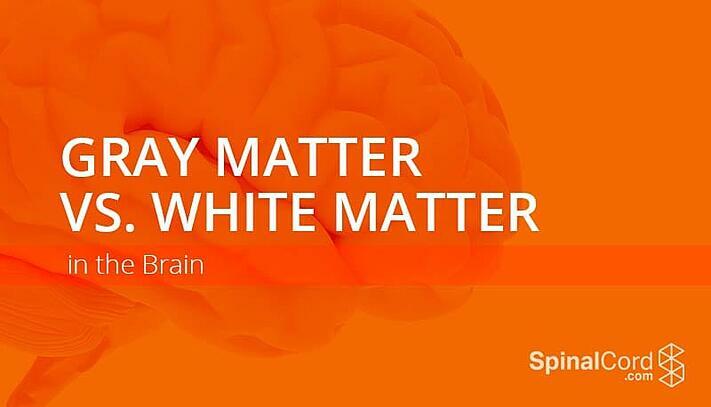 Remember, being an informed patient can help you ask intelligent questions and select the best treatment options, so if you don't understand what your doctor tells you about gray or white matter in the brain, don't be afraid to speak up. Keep asking questions until it all makes sense; every traumatic brain or spinal cord injury survivor has to learn to be a strong advocate and asking pointed questions can help you begin mastering the art of advocacy.